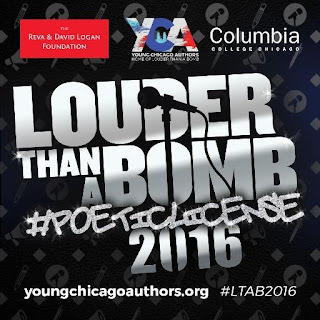 Young Chicago Authors (YCA) presents the world's largest youth poetry festival, the 16th annual Louder Than A Bomb (LTAB), a stage for talented teenage poets to compete for individual and team honors. This year's festival will include hundreds of Chicago-area poets facing off at more than 90 events starting on February 13 and culminating with two special celebrations: a Sweet 16 anniversary Benefit Party honoring hip-hop legend Chuck D of Public Enemy at the Metro Chicago (3730 N Clark St) on Friday, March 18; and the LTAB Team Finals showcasing the top four high school teams competing in an Olympic-style poetry slam with a special half-time show by Jay Z's Roc Nation label’s new signee, Vic Mensa, at Chicago’s Auditorium Theater (50 E Congress Pkwy) on Saturday, March 19. LTAB 2016 will take place at 10 venues, featuring the talents of 1,200 students from more than 125 schools across 120 different Chicagoland zip codes. Participants work year-round to craft lyrically acrobatic performances that cover many pivotal topics including policing, social justice and equity, which often have spectators on the edge of their seats. This year’s festival will be presented with the help of some of the city's most accomplished lyricists including educator and vocalist Jamila Woods, award-winning poet Nate Marshall as well as Chicago hip hop stars Vic Mensa and Chance the Rapper. Chuck D of Public Enemy, aka Carlton Douglas Ridenhour, is an award-winning emcee, author, and producer that inspired the festival’s name with Public Enemy’s 1988 hit “Louder Than a Bomb.” On Friday March 18, at Metro Chicago, Chuck D will co-host, with Public Enemy’s DJ Lord, the Sweet 16 Benefit Party; he will be interviewed on stage during the “Hip Hop History Lesson” portion of the event and will perform some of Public Enemy’s greatest hits. The following evening, Saturday, March 19, at the LTAB Team Finals, Chuck D, DJ Lord and LTAB founder Kevin Coval will present the “LTAB Chuck D Lyrical Terrorist Award” to the youth participant that most showed an approach to activism in their work throughout the five-week 2016 LTAB festival. · Preliminary Bouts: February 17 – 20 and February 24 – 27 at Columbia College Chicago. · Semi-Finals: March 15 at the Metro Chicago from 10 a.m. – 9 p.m.
· Indy Finals: March 17 at the DuSable Museum of African American History starting at 6 p.m.
· Sweet 16 Benefit Party: March 18 at the Metro Chicago. · Team Finals: March 19 at the Auditorium Theater starting at 6 p.m.
For ticket information about the 2016 LTAB festival and the 2016 Benefit Party visit: youngchicagoauthors.org. Entering its 16th season, LTAB is the largest, youth poetry festival in the world. With 14 chapter sites around the country, the festival will move to the Los Angeles area with the launch of a Compton festival in 2016. LTAB was founded in Chicago in 2001 and is hosted and produced by the non-profit organization Young Chicago Authors. LTAB offers high school in-class and afterschool teams focused on a Literary Arts curriculum as a team sporting event -- with goals of growing reading and writing literacy combined with social and emotional development work that inspires young people, teachers and artists to invigorate educational spaces. Running from February to March, the five-week Chicago Louder Than A Bomb festival attracts participants from diverse socioeconomic and cultural backgrounds. This year, more than 90 performances will engage the festival participants in bouts, panel discussions, literary readings and multidisciplinary art battles, and is expected to draw more than 10,000 attendees. Louder Than A Bomb Chapter sites around the country include: Tulsa, OK; Ann Arbor, MI; Detroit, MI; Boston, MA; Washington DC/Maryland/Virginia; Omaha, NE; Camden, NJ; Kansas City Metro and Ontario, Canada. Over the course of the year, YCA also serves over 10,000 young people in Chicago through various year-round workshops, residencies and projects in writing, publication and performance education.